Dr. Stiff-Roberts received both the B.S. degree in physics from Spelman College and the B.E.E. degree in electrical engineering from the Georgia Institute of Technology in 1999. She received an M.S.E. in electrical engineering and a Ph.D. in applied physics in 2001 and 2004, respectively, from the University of Michigan, Ann Arbor, where she investigated high-temperature quantum dot infrared photodetectors grown by molecular beam epitaxy. 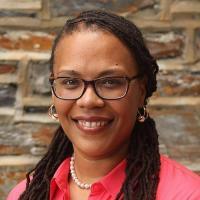 Dr. Stiff-Roberts joined Duke University in August 2004, and she is a Professor of Electrical and Computer Engineering. Dr. Stiff-Roberts' research interests include the synthesis of multi-component and hybrid (organic-inorganic) materials using a novel approach for organic-based thin film deposition that combines solution and vacuum-processing. Known as emulsion-based, resonant infrared matrix-assisted pulsed laser evaporation (RIR-MAPLE), this technique offers a completely new way to integrate novel functions into organic-based films and devices that are difficult, if not impossible, to achieve otherwise. Research efforts include materials synthesis and characterization to investigate the fundamental mechanisms of thin-film growth using RIR-MAPLE, as well as device fabrication and characterization for a broad range of applications (especially optoelectronic and energy devices). Ferguson, S; Williams, CV; Mohapi, B; Stiff-Roberts, AD, Deposition of β-Polyfluorene by Resonant Infrared Matrix-Assisted Pulsed Laser Evaporation, Journal of Electronic Materials (2019) [10.1007/s11664-019-07115-8] [abs]. Dunlap-Shohl, WA; Barraza, ET; Barrette, A; Gundogdu, K; Stiff-Roberts, AD; Mitzi, DB, MAPbI3 Solar Cells with Absorber Deposited by Resonant Infrared Matrix-Assisted Pulsed Laser Evaporation, Acs Energy Letters, vol 3 no. 2 (2018), pp. 270-275 [10.1021/acsenergylett.7b01144] [abs]. Barraza, ET; Dunlap-Shohl, WA; Mitzi, DB; Stiff-Roberts, AD, Deposition of Methylammonium Lead Triiodide by Resonant Infrared Matrix-Assisted Pulsed Laser Evaporation, Journal of Electronic Materials, vol 47 no. 2 (2018), pp. 917-926 [10.1007/s11664-017-5814-0] [abs]. Stiff-Roberts, AD; Mitzi, DB; Barraza, ET; Dunlap-Shohl, WA, Resonant Infrared Matrix-Assisted Pulsed Laser Evaporation of Hybrid Perovskites, Advanced Photonics 2018 (Bgpp, Ipr, Np, Noma, Sensors, Networks, Sppcom, Sof) (2018) [10.1364/noma.2018.nom4d.2] [abs].